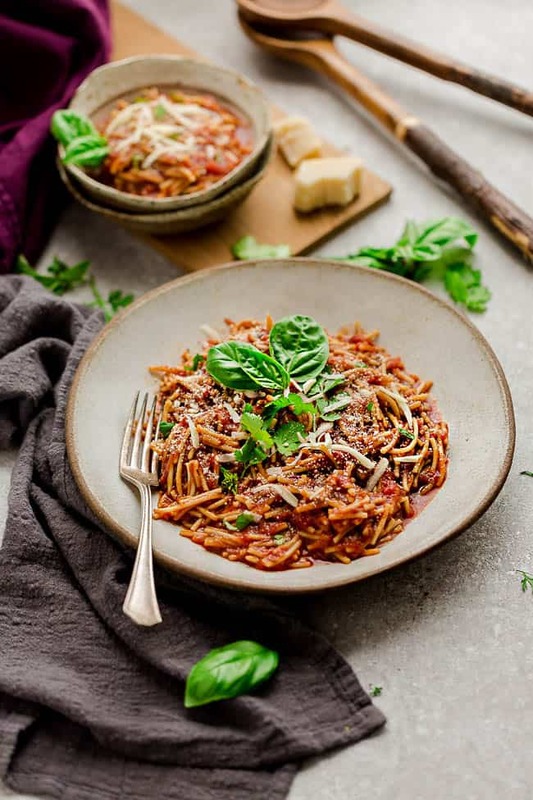 Instant Pot Spaghetti – this easy recipe takes less than 10 minutes of prep and is perfect for busy weeknights. Everything cooks in the pressure cooker (even the pasta noodles) in under 30 minutes with just one pot to clean. Have you ever made Spaghetti in the Instant Pot? It is seriously one of the easiest dinners you can make. After making this reader favorite Instant Pot Baked Ziti, we couldn’t wait to try Instant Pot Spaghetti. 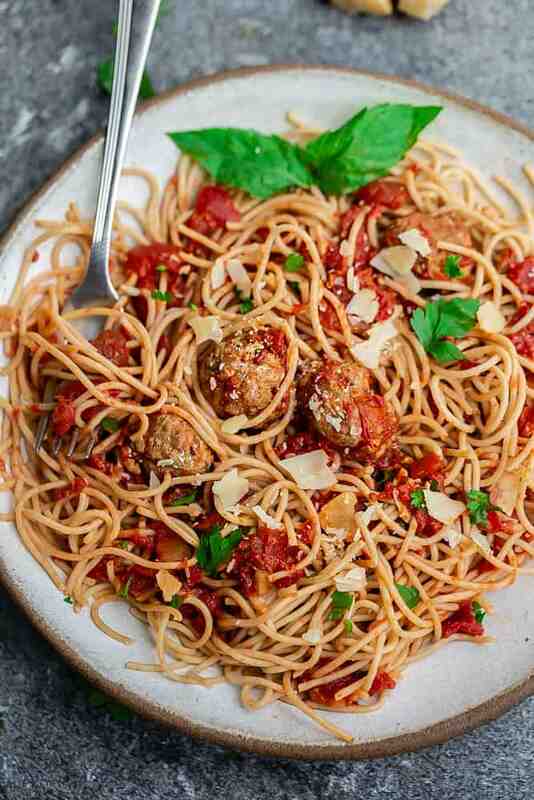 My kids are crazy about spaghetti and meat sauce or any pasta and this simple recipe is perfect on those days that you don’t want to turn on the oven. Everything (yes even the pasta) cooks up in your pressure cooker. 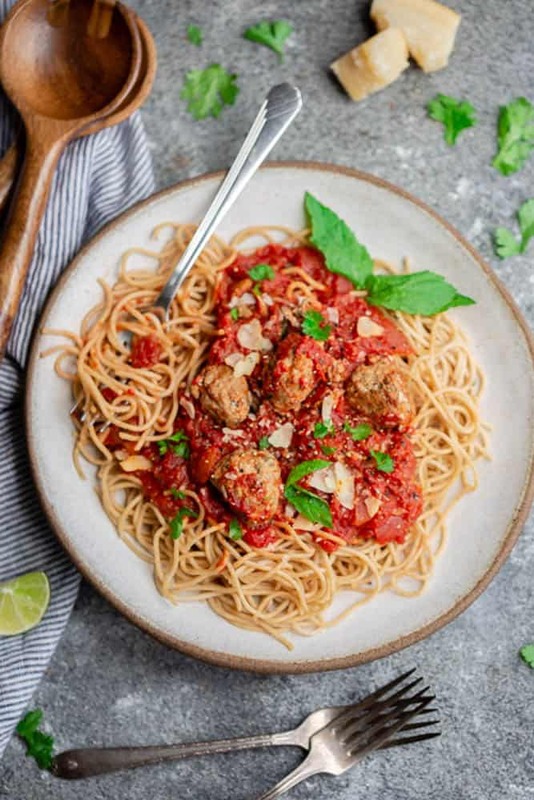 Even though we all think spaghetti and meatballs is a simple dish, it still requires using two pots: one for the sauce, another one for boiling the pasta, then a colander to drain it. And if you’re making meatballs, you’re going to need a separate pan for that. 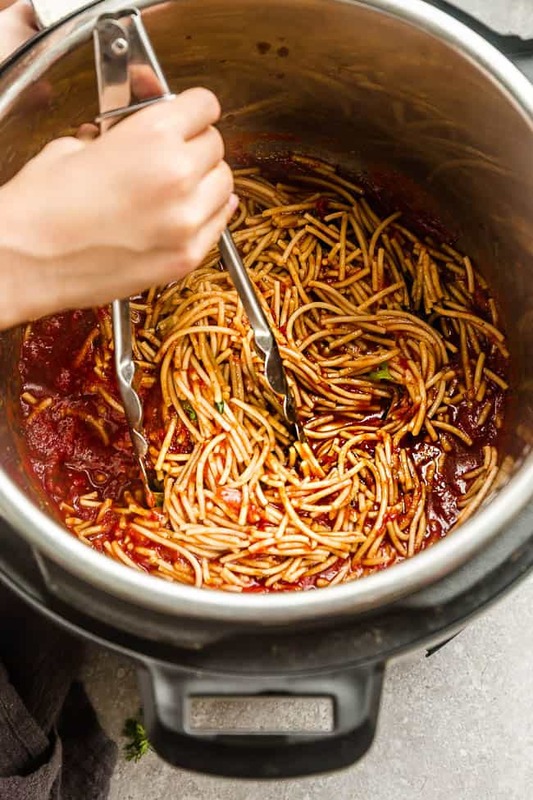 So can you really cook spaghetti noodles in a pressure cooker? Yes, absolutely! With this Pressure cooker spaghetti with meat sauce, it’s a true one pot dinner. And I know my kids aren’t going to make a fuss when they ask “what’s for dinner, mom?”. 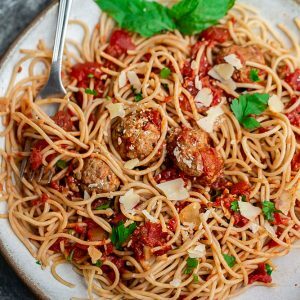 Although some people might think spaghetti is boring, this classic family favorite is always a crowd-pleaser at our house. You’re going to start off by browning the meat if you’re making a meat sauce. We like to use ground turkey but beef (or even chicken) would work great. Be sure to drain the inner pot once the meat is cooked – that way you don’t have that excess liquid and grease. Add the onions, garlic, salt, Italian seasoning and tomato paste and cook until fragrant, about 2-3 minutes. Break the spaghetti noodles in half, then add in two-four layers in the pot, cross-wised (this prevents sticking). Pour in the entire jar of your favorite pasta or marina sauce, basil. Then add the can of tomatoes and water. Cover with lid and set to 7 minutes on HIGH using the MANUAL or PRESSURE COOK button. Allow the Instant Pot to come to pressure and do it’s thing. After 7 minutes of cooking time, do a QUICK RELEASE using towel or a long wooden spoon to push the sealing valve to release. Use a fork to gently toss – then divide into plates and serve hot with additional Parmesan cheese and chopped parsely, if desired. Since the dried pasta cooks together with the sauce, be sure to look for thin pasta noodles with an al dente cooking time of 9-11 minutes. I’ve tried this with gluten free pasta as well and it came out perfectly – just be sure to check the cooking time. Break the noodles in half before adding them to the Instant Pot. Place them down in two layers criss-crossed over the pot or browned meat, if using. Use a high quality thicker pasta sauce – I used Rao’s. CAN I MAKE SPAGHETTI AHEAD OF TIME AND FREEZE IT? This spaghetti is freezer-friendly so if you want, you can freeze and reheat for future dinners or you can divide and bring into work or school lunch boxes. allow the pasta to thaw slightly in the fridge before you reheat it. Instant Pot Spaghetti - this easy recipe takes less than 10 minutes of prep and is perfect for busy weeknights. Everything cooks in the pressure cooker (even the pasta noodles) in under 30 minutes with just one pot to clean. Press the SAUTE button on the Instant Pot. Once it's hot, add the olive oil then add the ground meat. Cook and crumble the meat until it is browned and cooked through (about 3-4 minutes). Drain any excess grease. Stir in the shallots, garlic, salt, pepper, oregano, basil and tomato paste and cook until fragrant, about 2-3 minutes. Break up the spaghetti noodles, then place in the pot over the meat in 2-4 layers criss-crossed (to prevent sticking). Pour the sauce and diced tomatoes and water covering the noodles. Do not stir and push the noodles down to ensure they are completely submerged in the liquid. Cover with lid and set the valve to sealing. Press MANUAL or PRESSURE COOK and set to HIGH pressure for 7 minutes. Allow the Instant Pot to come to pressure and do it's thing. After the cooking time is up and you hear a BEEP, do a quick release by pushing the valve to RELEASE using a towel (to avoid mess) or a long wooden spoon with a towel covering the vent. Carefully open the lid then sprinkle in some Parmesan. Do not stir and allow to sit for 1-2 minutes for the cheese to melt and the pasta sauce to thicken up. Serve with Parmesan cheese and fresh parsley and/ or basil, if desired.